I’ve noticed a lot of people saying they are new to blogging in the comments lately, so I definitely thought this was worth a mention. Yaro Starak has developed quite a reputation as a blogging mentor, but now he’s reaching out to those who are much newer to the blog life. First of all, Yaro and his new partner (ahh… partners!) 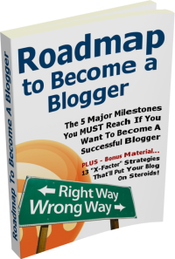 have released the free Roadmap Report – a guide to becoming a blogger. I like the emphasis they place on multimedia, which is the way things are headed without doubt (they even have an audio version of the report). Continuing to walk the multimedia talk, the pair have also released a series of 10 free Become a Blogger videos. Nice production and solid information for the newbie blogger. Previous article: Will You Be Seth Godin’s Apprentice? This is a great report for bloggers, its full of more useful information than the yellow pages! ;), plus if you sign up for it, you can also download the podcast version and have it read to you, thats just soo lazy!, but oh so easy!;). That’s right, I forgot there was an audio version… fixing. Interesting. I’ve been working on launching a new blog, but I had 3 ideas for areas to explore (I have an eclectic resume) . I thought, “starting all 3 is way too crazy” but actually, I am going by roadmap. I’ve gotten a little content up on each one, wondering which I would pursue. I guess I’ll go ahead with all 3 for now. Now to work on pillar content for 3 vastly different subjects! But seeing that Yaro wouldn’t risk his reputation, I say that it’s going to be a good read. The actual ‘learning’ part starts on page 17, but so far it looks like a good read. Yes those videos and books will be great help for new blogger. I have downloaded it and read it. Almost on spot. Thank you for the resource! I don’t consider myself a newbie but I do like to check these reports out and see if there’s ever any basics that I’ve missed out. I’m fed up of reading about Yaro. I’m sure he’s an absolute God among Bloggers but his constant in your face hype about making mega bucks is really irritating!! Despite his sincere messages that he wants to help all us clueless bloggers – he’s only in it to feather his own nest! Give some of your vast wealth to charity mate. Half the world is starving – money is not everything! !